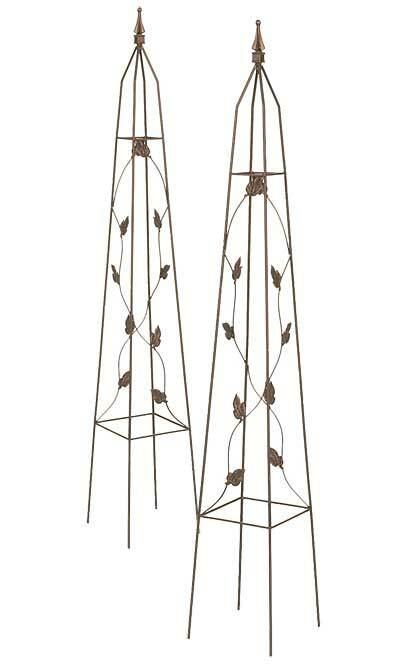 Support two climbing plants while celebrating nature with these Gardman Brushed Bronze Leaf Motif Obelisks. These 2, ornate metal structures bring height to your garden or a potted plant, while the leaf and twig shapes throughout them enhance your flower or shrub. The four sides of each obelisk provide plenty of support for climbing plants, and the units each culminate in a finial for a classic look. A brushed bronze finish accents the leaf and twig shapes, which seem to reach from one panel to the next for a striking spiral. The metal construction of each piece remains durable for many seasons, and the 9" square base is fantastic for placement over a small to medium plant. Insert the 12" long legs on each unit into your soil, or add the obelisks to large pots for a versatile adornment. Enhance the foliage in your garden or on your patio with these Brushed Bronze Leaf Motif Obelisks. Note: This case pack includes 2 of the Gardman Leaf Motif Obelisks, Brushed Bronze, 59.5". Gardman Leaf Motif Obelisk, Brushed Bronze, 59.5"